Summer's over, and I need to come to terms with that. I must accept that it's time to break out my long-sleeved shirts and space heater, and I must face the fact that it's time for some comforting fall food. Case in point: Fresh apple cake. New York is an apple-happy state. I've enjoyed experiencing the many varieties of different shapes, sizes, colors, flavors, and textures. One of my favorite finds is the Macoun. Interestingly, one of my co-workers recently told me it's one of the few varieties that she can eat. Apparently she's allergic to a protein found in most types but not present in the Macoun. Good to know. I'll tell ya--she couldn't have hand-picked a better apple to be able to eat. 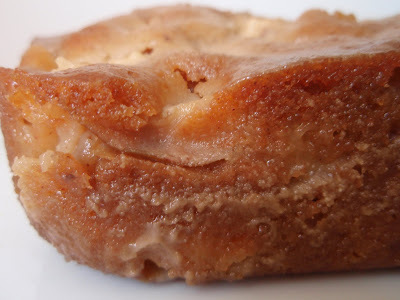 The Macoun is subtly sweet and perfectly crisp, and I decided it would be the perfect choice for a fresh apple cake. I have a recipe for apple cake that I love, but in the interest of potentially finding something better, I gave another recipe a shot. The corners are CLEARLY the best part--the glaze trickles down and pools up, ultimately seeping into and saturating those four areas of cake. We're talking prime real estate, folks. 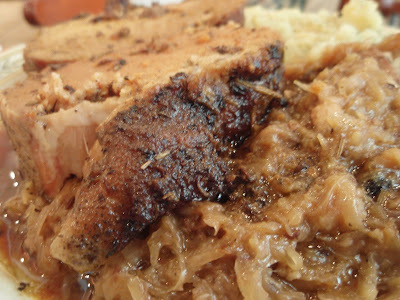 The resulting delight from FoodMayhem (a wonderfully-maintained and awesomely-titled blog that you should all explore) was everything the quintessential fall treat should be--redolent of warm spices, moist, sweet, and completely comforting. Eating it felt like receiving a giant bear hug. Not a bone-crusher, mind you, but a nice, love-filled squeeze. 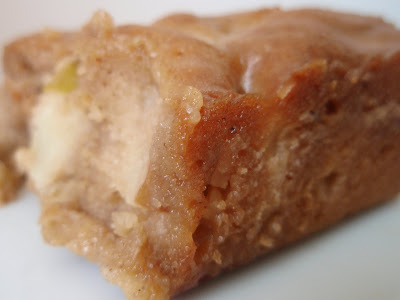 Is this my new favorite apple cake? For now, the apple dapple cake reigns supreme, but that's not to say I'd ever turn down a hefty slab of this one. Preheat oven to 350 degrees. Spray down a 13x9-inch pan. In a large bowl, combine flour, baking soda, and cinnamon. Separately whisk together eggs, sugar, oil, applesauce, and vanilla. Stir the wet ingredients into the dry. Fold in the apples. Pour into the prepared pan and bake for 45-50 minutes, or until a toothpick comes out clean. After back-to-back-to-back-to-back tiny little restaurant spaces, I was a bit surprised by the décor of Mamoun’s Mideast Cafe. There was a bar! With stools! And more than 10 tables! And subtle music! I was ready for my taste buds to be astounded. 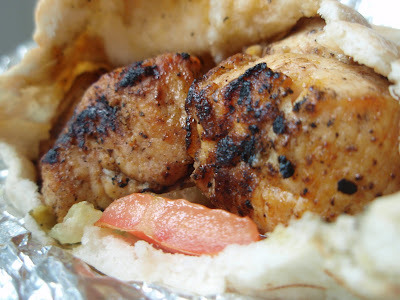 I placed my order for the chicken kabob sandwich ($5.99 + tax) with tomato and lettuce, sauce (tahini—woohoo!) on the side. I was served with a wrap half the size of all others I’ve tried--not a good initial impression. 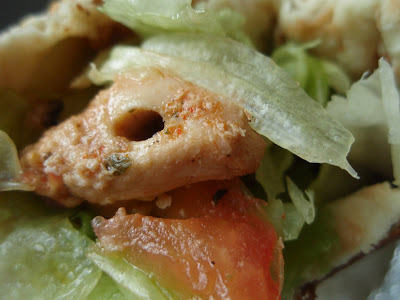 I opened the foil to find a pita pocket with char-grilled hunks of juicy chicken placed atop the lettuce and tomato. After spending way too much time trying to figure out how best to maneuver the wrap such that I got a bite of everything, I finally just dove in. And the bottom fell out. 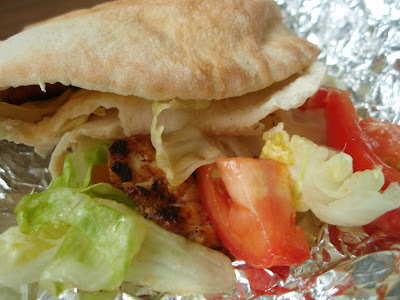 Yeah, the pita was pathetic and I just wasn’t a fan of how the entire thing was put together. Although I really enjoyed the char on the chicken and the fact that it was tender and moist, there was no seasoning on it of which to speak. That was disappointing. What was even more disappointing was the tahini. 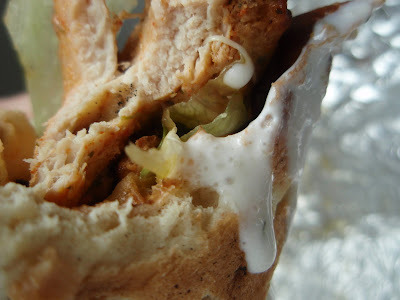 I love tahini, and this has been my first wrap making use of it. 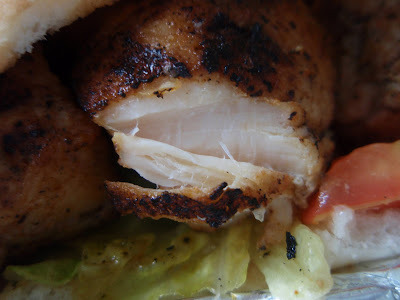 Mamoun’s was nice and creamy but way too salty--I could barely choke down a bite containing it, and that's coming from a salt-addict lover (just ask anyone who's ever dined with me). I was hoping it would salvage what was heading toward being a total disaster, but it didn't. My verdict? Unfortunately, I don’t think I got my money’s worth here. It was something I could easily replicate at home, and with much neater and less-frustrating results. Do you ever resolve to make a particular dish, only to find two or three or twelve equally-appealing recipes for it? I do. Often. Sometimes I simply can't decide which to use, so I just go ahead and make multiple versions. This is one of those times. 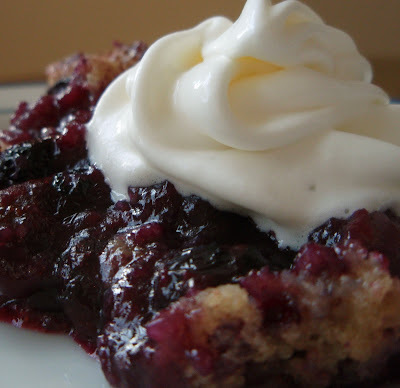 I recently found myself with about five quarts of blueberries on my hands and a powerful, no-use-fighting-it, resistance-is-futile craving for cobbler. 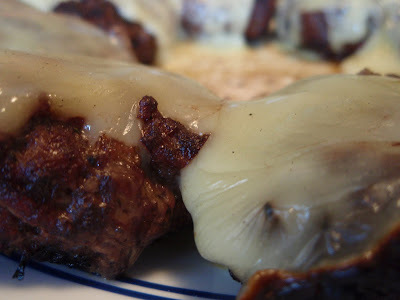 I have a go-to recipe, as I suspect you all do, but I wanted to find something even better. Selection B--a hot, sloppy, tasty mess. Topping of choice: Whipped cream. I narrowed it down to two recipes. 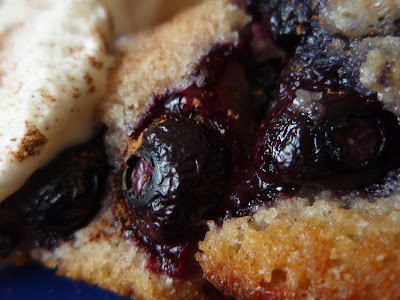 Choice A was that of food blog juggernaut Pioneer Woman, and selection B was an interesting creation that's remarkably similar to this pudding cake that I bookmarked immediately upon seeing. Choice A--a little cake-ish (with crackly bits along the edges) and a lot delish-ish. Essential accompaniment: Vanilla ice cream. 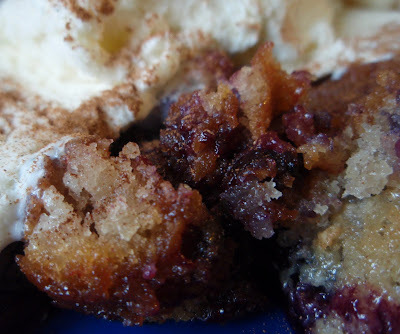 The resulting cobblers were remarkably similar, with A having more of a cake-like substance and B providing a wonderful goo-factor. Both were so delicious and perfect that I refuse to pick a winner. Nope. Ain't gonna do it. Do you like pork products, or simply pigs in general? Are you a glutton for verbal (and, in some instances, physical) punishment? Most importantly, do you have a sense of humor and a hunger for fine, filling, and flatulent food? If so, this place is for you. I made my way down to State College, PA, over Labor Day weekend to spend some quality time with my family. 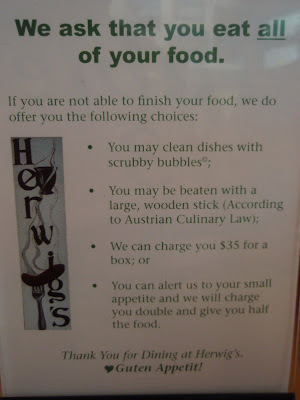 My brother, who's currently living there, has stumbled upon quite the unique and extraordinary restaurant--it’s called Herwig’s, and it’s magnificent. 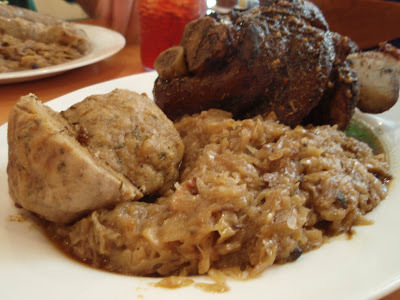 The cuisine is all Austrian, all the time, and although I can’t speak from personal experience, it’s all authentic too. Aside from the delectable dishes, which I’ll describe momentarily, one of the draws of this place is its utter disregard for manners and niceties. The servers and cooks aren’t afraid to bully the patrons, and do so with wild abandon. They’ll even pelt you with plush pig toys when you're not looking. It’s all in fun, though, and it all is fun. Particurlarly enjoyable is the eating portion of the experience. The options are handwritten on a chalkboard in German, and there's no pointing and ordering--they make you say what you want, no matter how badly you butcher the pronunciation. His only disappointment? The place is BYOB, and he had none. 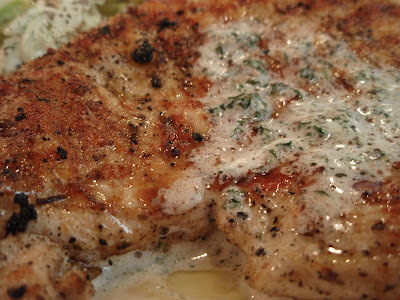 The seasoning of the chicken was wonderful, and the pat of herbed butter on top certainly didn't hurt. I really enjoyed the potato salad--it was mostly smooth with an occasional hunk of soft tuber, with hints of mustard shining through. We were all pleased, and aside from Mammy’s shameful display, we were all members of the Clean Plate Club. 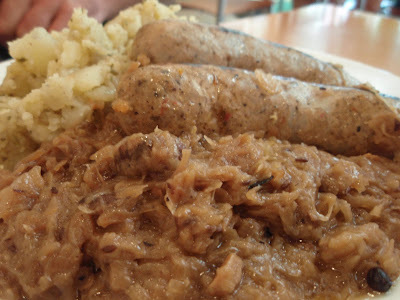 Herwig's is good eats. 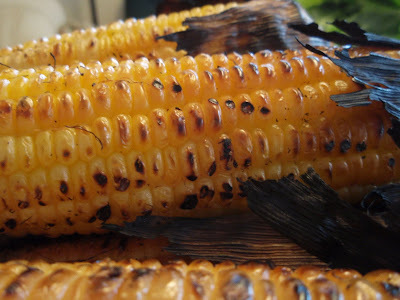 ...and grilled corn--can the rods of golden kernels get any better? I vote no. I also scored a bounty of tomatoes, potaters, and squash, canned green beans, salsa, and dilly beans, jams, jellies, apple butter, applesauce, and a good dose of lovin'. Even though I've been living 700 miles away for about two years, my Mamster still takes good care of me. My chicken wrap quest has taken me in both the Greek and Lebanese directions, so my visit to the heavily Indian-influenced Aashiana was a new experience. I entered the small restaurant space tentatively, and a man in the corner immediately jumped up from a table and greeted me warmly. There were a few other patrons and a LOADED buffet. The smell of curry (not my favorite) permeated the air, but I pressed on and ordered the Kebab Mashweh ($5.99 + tax), described as a chicken kebab wrapped in bread. Lettuce and tomato were included, and I got the sauce on the side. As I waited for my wrap to be made, I watched the diners go back to the buffet again and again. Apparently, the buffet is quite a draw, and from what I could see, the variety and quantity were outstanding. But I wasn’t there for the buffet, I was there for a delicious chicken wrap. Did I get one? Yes, yes, I did. 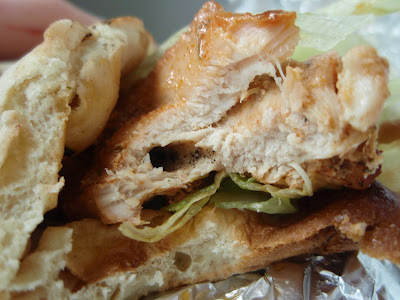 My first bite included some SUPER spicy (we’re talking lip burns here) hunks of chicken ensconced in a soft, pillowy, and slightly chewy naan. I loved the burn, I loved the nicely-browned naan, and I loved the amazing sauce, which was a bit thin but perfectly-made with bits of dill and cucumbers. The only complaint I can possibly make is that the chicken was quite fatty--I don’t care who you are, you don’t want gristle in your mouth and I don’t either. The owner was extremely nice, and pretty much ordered me to come back and try the lunch buffet. I think I will. After two busts in a row, I found myself really needing some success in the kitchen. Choosing a dish in which caramel was involved might not have been the wisest move given its fickle nature, but it all worked out just splendidly. Perhaps you recall my super-duper Terribly Terrific Toffee, the tasty little treat that made its debut around Christmas last year. If not, I must insist that you check it out this instant. Go ahead. I'll wait. Pretty impressive, right? Well, imagine it DOUBLED. That's right. Twice the toffee, twice the chocolate, twice the calories, and twice the deliciousness. 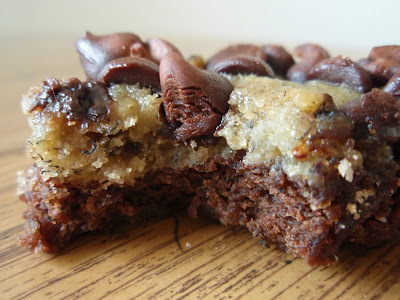 The edges were clearly the best part--more chocolate, more caramel, more euphoria. These delightful little bars are often referred to as homemade candy bars, and that's essentially what they are. 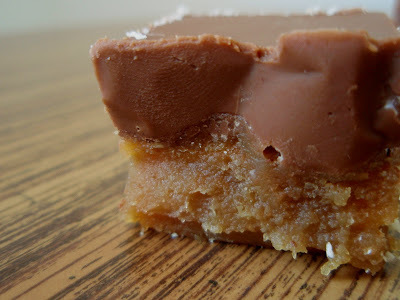 Although they look a bit like fat Kit Kats or perhaps a mega Twix bar, my batch really tasted like a Snickers. I think I was a bit over-generous with the peanut butter, but I didn't hear any complaints. Or make any myself. Which is rare. Line an ungreased 9x13-inch baking pan with foil, leaving an extension of foil on either end. Line the foil with one layer of saltine crackers. In a large saucepan, melt the butter over medium heat. Add the graham cracker crumbs, brown sugar, milk, and sugar. Bring to a boil and cook for 5 minutes, stirring constantly. (Begin timing 5 minutes from when you see the first bubbles.) Remove from the heat and spread half of caramel mixture evenly over the crackers. 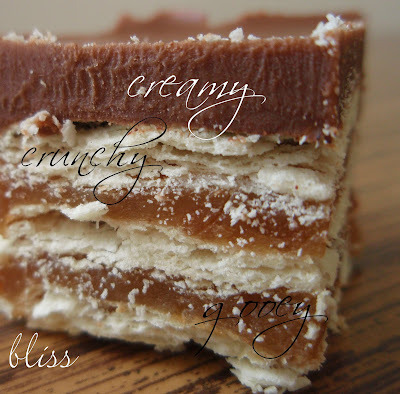 Place another single layer of crackers over the caramel mixture. Spread the rest of the caramel mixture evenly over crackers and top with the remaining crackers. In a small saucepan (or in the microwave), combine the peanut butter, chocolate morsels, butterscotch morsels, and shortening. Melt over medium-low heat, stirring constantly. Pour and spread evenly over the top of crackers. 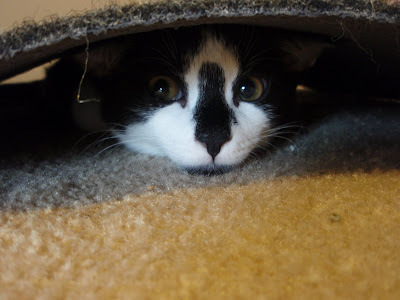 Cover, and chill for at least 1 hour. Lift foil overhang and remove bars from pan. Cut into bars. Store in the refrigerator. I've officially lost my kitchen mojo. After my devastating brownie debacle, it took me awhile to get geared up to bake again. However, when I had several bananas take a turn for the worse, I decided to bite the bullet and get back into the kitchen. 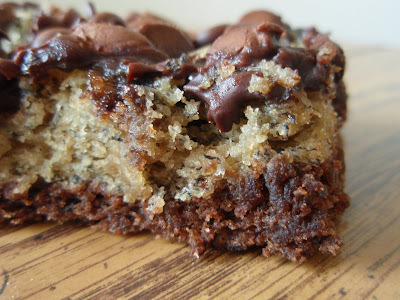 I’d seen these black bottom banana bars on quite a few of my favorite blogs, so I gamely picked them to try. Other than tossing a few chocolate chips into banana bread or diving into a frozen chocolate-covered bananner, I can’t think of a time when I’ve eaten chocolate and banana together. So what happened this time? Two things--a)I used too much banana, and b)I took the bars out of the oven way too soon. 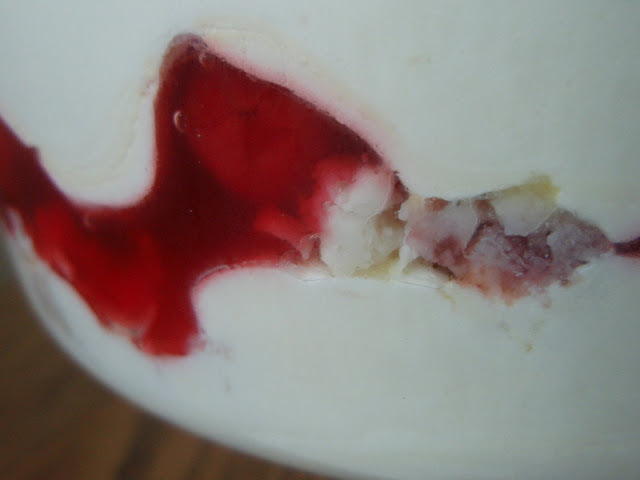 Once again, the middle was sticky and wet, and by the time I realized this, the bars were cooled. I know it’s wrong to pop a cake that has already cooled down back into the oven, but I figured I didn’t have anything to lose. I set the oven to 250F and walked away. When I remembered that I had done this an hour later, I pulled them out. There didn't seem to be much difference. Knowing that my co-workers will eat just about anything, I persevered and cut out the parts that were cooked through. I refused to waste another batch of ingredients. To my great relief, the bars were inhaled, and more people than usual went out of their way to compliment me. Isn’t that always the way? Toil, labor, and sweat over something and it’s hardly appreciated. Barely exert any effort at all and everyone is beside themselves with appreciation and delight. Sigh. Maybe these kitchen blunders are Dorie's way of getting back at me for disliking her cake. Are her powers that strong? Preheat oven to 350F. Grease a 13x9-inch pan. In a large mixing bowl, cream the butter and sugar. Add the egg, vanilla, and bananas and beat until thoroughly combined. Separately combine the flour, baking powder, baking soda, and salt. 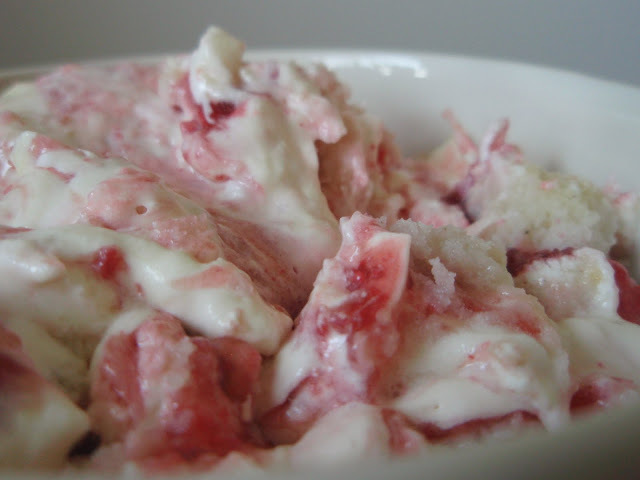 Add this to creamed mixture and mix well. Divide the batter in half. Add the cocoa to half, blend well, and spread into the prepared pan. Spoon the remaining batter on top and swirl with a knife. Sprinkle with the chocolate chips. Bake for 30 minutes or until the bars test done. Cool completely before cutting.